The Auchumpkee Creek Covered Bridge was completed in October, 1892 by the firm of Herring and Alford for the sum of $1,194.98. The bridge had a span of 96 feet between the stone piers and a total length of 120 feet 9 inches. It was designed by Dr. J. W. Herring (1823-1911). It is of the Town Truss design which was patented in 1820, by Ithiel Town of Connecticut. The 3 by 10 inch heart pine crisscross lattice of the bridge trusses are pinned at the joints with wooden pegs and are very strong. It was said of this design that it could be built by the mile and cut off by the yard. Bridges were covered to protect the structural parts form the elements to prevent decay. Other reasons given for covering bridges included providing shelter for people and cargo during storms, and enabling animals to cross gorges of flowing water. This bridge was closed to vehicular traffic in 1985. The original bridge was the fourth bridge that stood at this site. The bridges here have also had several names including the Hootenville Bridge, Wilmont Bridge, and Respess Bridge because they took their name from the owners of the nearby mill. In July 1994 tropical storm Alberto dumped 15 inches of rain onto the area in a single day and turned placid Auchumpkee Creek into a raging river. Washing a huge tree limb along like a battering ram, it knocked the Auchmpkee Creek Bridge from its stacked stone moorings and smashed it against the overpass on Allen Road, 30 yards downstream. With more than $200,000 in federal disaster relief money, the Upson County Commission and Historic Preservation Commission were able to hire one of the few abiding covered-bridge craftsmen in America, Arnold M. Graton of Ashland, N.H. to re-create the bridge. 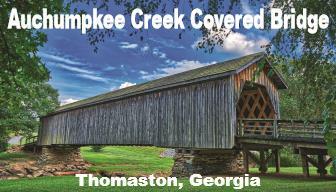 In 1997, the Auchumpkee Creek Covered Bridge, now 96 feet in length, was completed. The dedication for this bridge took place during the City of Thomaston’s Covered Bridge Arts Festival, October 9-11, 1998.